Fall Home Invaders: spiders, stink bugs, and more! The calls have begun. Insects and spiders are being found inside homes around Medina, and I suspect many other counties in Ohio. Fall brings an annual immigration of all sorts of arthropods but this is not meant to be a halloween horror, but a normal part of the life cycle and survival of many creepy (or cute!) crawlies. Brown Marmorated Stink Bug (Halyomorpha Halys), is a non-native invasive species that spends winter as an adult insect inside sheltered areas. 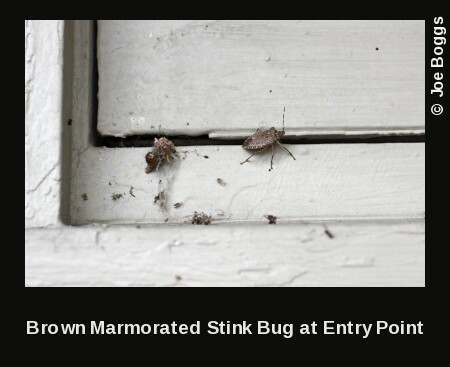 Outdoors this might include under mulch or bark, but often we find these stink bugs on our screens, siding, and inevitably in the house. In their search for a protected, sheltered spot, BMSB squeezes into any crack or crevice available to them. This could be a hole in a screen, under a door or open window, through a chimney, the soffit vents of your roof, or along any other vent and outlet that is missing its seal or insulation. Normally they remain out of sight, perhaps in a wall void or attic, but sometimes they make it into the main living area causing alarm. The important thing to know is that they do not bite people. They are not known to spread disease. They will not lay eggs in the home. They are plant-feeders using a piercing-sucking mouthpart to extract plant fluids from fruit and vegetable crops. They will not feed on wood or fabric. When bugs are found in the home you can shoo them out, catch them, or crush them. But remember they are "STINK" bugs for a reason. Another method is using a vacuum attachment with a nylon attached to the hose with a rubber band. The vacuum suction will pull the nylon and bug into the attachment hose, but the nylon will prevent the bug from entering the vacuum bag or canister and stinking up the works. Just pull the nylon out after collecting the bug and toss. Like the brown marmorated stink bug, the Western Conifer Seed Bug (Leptoglossus occidentalis) is also being seen on screens, sidings, and in homes. The Western Conifer Seed Bug, also known as the LEAF-FOOTED BUG is another plant feeder, this time feeding on the seeds and cones of conifers. You can identify this bug from its flattened, leaf-like rear legs. It also is looking to overwinter as an adult in sheltered places but does not lay eggs in or cause damage to homes. Unfortunately this guy is also being misidentified as the "Kissing Bug" (read more here on kissing bugs by Joe Boggs). And with these guys showing up for fall, we want to put the record straight. Fear not! The Western Conifer Seed Bug is not a blood-feeder and is not known to bite humans. The same removal management can be employed as for BMSB, a vacuum, hand, or piece of paper can easily collect and shoo this one back outside or into the trash. Spiders are often found around homes if prey is to be found. Both insects and spiders alike can be brought into the home by our own activity as well, carrying things in and out, opening and closing doors. But in fall, many spiders also seek shelter or go searching for mates. Funnel weaver spiders are one such spider that is seeking mates in fall. Soul-searching males can often get turned around and end up inside homes on their noble quest, only to meet an untimely end under foot. Spiders also may enter homes looking for shelter as temperatures drop. And remember that many spiders are wandering or hunting spiders that have no web and actively move about to hunt prey. In this effort, they may accidentally end up in homes in search of food. While spiders can be unsettling to some, remember they are beneficial predators that help to keep pest populations down. Unless you accidentally sit on one or put your foot into a shoe where one is hiding, there is a low chance of being bit purposely. Spiders can be swept outside, caught in a cup and ushered back outside, or the good ole slipper does the job. People concerned with spider bites can use caution when donning clothes, gloves, hats, or shoes that have sat for prolonged periods of disuse. Also use caution when unpacking cardboard boxes that have sat, especially as we enter the holiday decor season. Gloves and long sleeves can be worn when sifting through storage boxes from the basement or attic. While none have been reported to me (yet), the multicolored asian lady beetle (Harmonia axyridis) is also another known home invader that is often found in the corners of your ceiling in fall. Just as the others, it's getting cold and they are seeking shelter. The Multicolored Asian Lady Beetles (MALB) are non-native predators of aphids and other soft bodied insects. In their native habitat, they would overwinter in cliffs and cracks in rocks, etc. Here, the bricks and siding of our houses do just fine (among other places such as wood piles, leaf litter etc). They are looking for cool and sheltered locations and are not purposefully seeking the interior of the home. Often they remain in attics, wall voids, or under shingles. But sometimes these lead into unknown cracks and spaces into the home. MALB is perhaps more noticeable as a fall invader because they aggregate together in corners. Where there is one, soon many may be huddled together. As reported in OSU's MALB factsheet, they will begin to seek shelter the first warm day (~64F) AFTER a very cold night, near freezing. So we may be seeing these more soon. As with the others, you can choose to release them alive after collecting with jars, cups, or vacuum + nylon method (as described in our MALB factsheet here), or crush and toss. A word of caution for MALB- they can leave an orange stain when crushed or squeezed so be careful collecting them off your white walls and curtains! In general, all these home invaders may be seen again on warm days in winter when temperatures can rise enough to warm these house guests up and make them a little active again. Just know that they are not harmful and can be easily collected and removed. Preventative measures can include inspecting the home for obvious entry points. Check caulking and seals along windows, doors, pipes, wires, and anything that requires a hole in the house to reach the exterior (outdoor faucets, dryer vents, soffit vents, attic vents). Fix cracks, screen holes, or drafty leaks, but do not seal off anything that is supposed to vent and let air through!